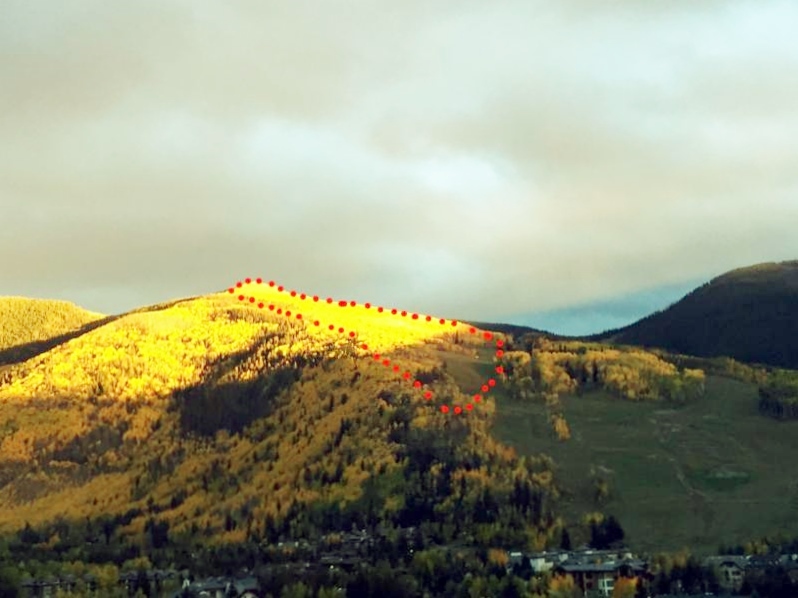 Enclosed for your review is a copy of the Draft Environmental Impact Statement (Draft EIS) for the Vail Mountain Resort Golden Peak Improvements Project. This Draft EIS has been prepared to analyze and disclose the potential environmental effects of implementing projects to improve ski/snowboard racing terrain and associated facilities. These projects would occur within the resort’s existing Special Use Permit (SUP) area and would be consistent with the 2007 Vail Resorts Master Development Plan Update. The Proposed Action includes: construction of one surface lift (T-bar or similar design) and approximately 42 acres of new ski trails for women’s Downhill and men’s Super G courses, moguls course and skier cross course; lift operating buildings, race start buildings, equipment storage, fuel storage, and maintenance building; infrastructure to support snowmaking on new ski trails; access road for construction of new lift and ski trails; staging areas and logging decks for construction materials and timber removal; and vegetation removal and surface smoothing/grading for new ski trails and drainage management. Comments on the Draft EIS will be accepted for 45 days from publication of the Notice of Availability (NOA) in the Federal Register (the anticipated date of publication of the NOA is April 6, 2018). The NOA provides the sole means of calculating the close of the Draft EIS comment period. The entire Draft EIS can be reviewed and downloaded at the project website at: https://www.fs.usda.gov/project/?project=47937. Hardcopies may be reviewed at the Forest Supervisor’s Office in Glenwood Springs and the Eagle-Holy Cross Ranger District office in Minturn. CDs of the Draft EIS are available upon request. A comment form is included on the website, which allows the public to submit comments on the Draft EIS electronically. Commenting through the website will provide the public and agencies with an easy to use and efficient commenting process while aiding the Forest Service with categorizing, analyzing and responding to substantive feedback. Written comments should be submitted to: Golden Peak Draft EIS, Scott Fitzwilliams, c/o Max Forgensi, Mountain Sports/Special Uses Administrator, White River National Forest, P.O. Box 0190, Minturn, CO 81645; comments can be hand delivered between the hours of 8:00 a.m.- 4:30 p.m., Monday-Friday, excluding holidays. The Forest Service encourages the public to use the project website and submit comments online. Electronic comments can also be submitted to: https://cara.ecosystem-management.org/Public//CommentInput?Project=47937, or in an email to mforgensi@fs.fed.us. If you choose to comment, please include: (1) your name, address, telephone number, and organization represented (if applicable); (2) title of the Draft EIS (“Golden Peak Improvements Project Draft EIS”) upon which you are commenting; (3) specific facts or comments with supporting reasons that I should consider in reaching a decision. Please be as specific as possible. Your comments will be considered prior to the release of a Final EIS and any decision for the project. Only those who submit timely and specific written comments will have eligibility to file an objection under 36 Code of Federal Regulations (CFR) § 218.8. This process gives an individual or entity an opportunity for an independent Forest Service review and resolution of issues before the approval of a plan, plan amendment, or plan revision. For objection eligibility, each individual or representative from each entity submitting timely and specific written comments must either sign the comment or verify identity upon request. Individuals and organizations wishing to be eligible to object must meet the information requirements in the 36 CFR § 218.25(a)(3). Comments received, including the names and addresses of those who comment, will become part of the public record for this project and will be subject to review pursuant to the Freedom of Information Act. Thank you for your interest and participation in this important project and I look forward to your comments. If you have any questions, please contact Max Forgensi, Mountain Sports/Special Uses Administrator, by email: mforgensi@fs.fed.us.